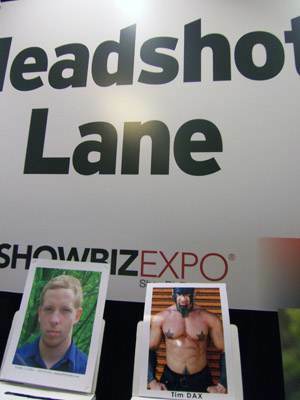 Self-described as “The largest networking event for the entertainment industry”, Showbiz Expo, held Sunday at the NY Hilton, provides a platform for services from teeth whitening to facilities hawking their stages and post suites. Yes, that’s the show’s odd mix, which becomes more apparent as you walk the aisles. With the few production-oriented companies overwhelmed by hordes of hopeful actors, models, and musicians filing past film and acting school come ons, free head shot stands, and the inevitable New York Times subscription table, it’s hard to know if this is a useful show or not. According to a page in the show brochure, Showbiz Expo realizes they need it to do something to address this by launching a conference for film and video production only. Whether that show finds enough of an audience to make it worthwhile–the ill-fated efforts of NAB East come to mind—probably still relies upon the interest of manufacturers to pony up more booth money for one more show beyond NAB and IBC. My trip did turn up three interesting companies amongst all the clutter. MediaMix makes its money by offering studios and services for production and post including graphic design, DVD production, and various interactive projects. But if the product now in beta proves viable, the small Allendale, NJ-based company may be coming out of left field with a big hit on its hands. 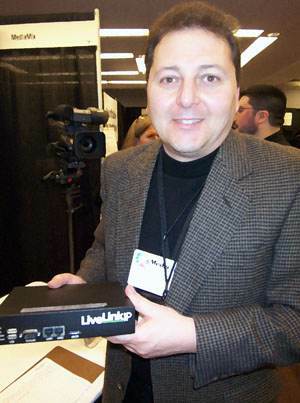 Joseph Vargas, president, showed me the latest iteration of his company’s LiveLinkIP, an IP-based HD delivery device. Now in field tests with a national broadcaster, users will just need to buy the rack-mounted computer for around $400 (basically dedicated to real-time crunching of HD video) and lease one of the little receiver boxes for up to four locations per computer. “Right now broadcasters and others are paying hundreds to thousands of dollars to transmit HD video via satellite and other high-speed links,” says Vargas. “With this device, they just need a reliable connection to the Internet to be able to transmit files in a fraction of that cost.” LiveLinkIP is expected to be offered for sale this fall. I was a little surprised to find that CBS had a booth–or rather it’s scenic construction shop was at hand–but that really shouldn’t have been news to me. As David Tasso explained, the shop has made its services available for number of years to outside productions from designers in charge of department store windows to movies that needed a quick turnaround on a specific prop. “We have everything from computer controlled milling machines to large-format printers,” says Tasso, scenic construction shop head at CBS Broadcasting’s W. 57th St. headquarters. Smaller productions that have little need to keep expensive gear in-house can turn to this union shop which, Tasso explains, makes specific bids on jobs. So rest assured: even if it takes more hours to finish than the union card might state, it gets done on time. “We’re used to getting requests from the morning show to turn something around overnight, so we have no problem delivering,” says Tasso. 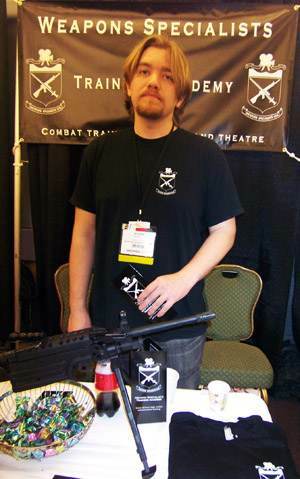 Located deep in the heart of Soho, the company has offered gun and blade safety training, along with prop guns, swords and other stage weapons to movies, TV and various productions at the Met for some 30 years. Weapons Specialists now claims it’s the largest theatrical weapons property house on the East coast. With the growth in film and TV production over the past few years in the city, the company has seen a new opportunity. “Because of all the demand from actors and others, we’ve decided to offer a regular training series on the safe, correct use of guns, swords, and other weapons,” says Ryder Washburn, vice president. The 16 hour course, which starts this spring, prices at $299.